Not too many vocalists seem to respond as naturally to the richer, more passionate narrative of the Jazz standard and Broadway tune; to its sweeping approach that makes its visual music one with the lyrical storyline of rhyming words. But Sherri Roberts is one of those chanteuses who seems to draw on the airy luminescent textures of these show tunes and she has the innate ability to drive the drama excitingly and with telling nuance, while avoiding the glibness and mushy sentimentalism that one reigned on 1950s and 1960s Broadway. Clearly on her wonderful 2017 album Anybody’s Spring, Ms. Roberts responds superbly and comes rather close-up to the listener’s field of hearing and vision too and seems to sing right in your face as she brings both the adventures and the misadventures of the protagonists of these musicals to life. In her entire performance – whether she is mining the depths of the Broadway musical tunes, or the Jazz standards such as Clifford Brown’s “Joy Spring,” to which Sherri Roberts added her original lyric to the vocalese, we find Ms. Roberts brings all the sensuality of her singular mezzo-soprano as she slides into character with lustrous glissandos that characteristically exchange pitch-perfect singing for the fascinating idolatry of the narrative. Shortly thereafter Ms Roberts takes on Antonio Carlos Jobim’s “Double Rainbow” where she allows herself the luxury of some rare moments as her high notes soar with cutting power – unusual for a mezzo – without letting her lower range curdle. Throughout the extraordinary experiences of the two songs we are treated not only to astute pianism from her accompanist David Udolf, but also by remarkable, sensitive performances from bassist Harvie S, and also elsewhere from the ineffably beautiful guitar of Sheryl Bailey. Despite the gentle pace of the music throughout the set, it feels natural and never once is there any feeling of an attempt to over-sedate the tempos. If anything one cannot help being held breathless especially when bassist Harvie S slides out his bow and plays con arco as few other bassists can play. In fact, Sherri Roberts could not have asked for better accompanists than those in the garb of Harvie S, Sheryl Bailey and David Udolf. The great drummer Akira Tana is no less essential to anchoring this remarkable recording. 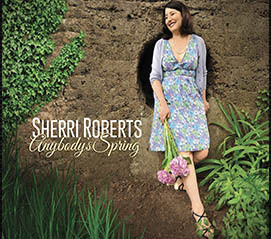 Be the first to comment on "Sherri Roberts | Anybody’s Spring"